Peel and core the apples, then cut into small pieces and place them in a saucepan with the sugar and 2 tablespoons of water. Cook on high heat for 5 minutes, stirring the mix. Take the apples off the heat, add the cornflour, cinnamon and blackberries, and mix together. Cut 8 circles from the pastry and scoop a spoon of the apple and blackberry mix into the middle of 4 circles. Close with the remaining 4 circles of pastry, and use a fork to seal the edges together. Cut leaf shapes out of the remaining pastry and add 2 to each circle. 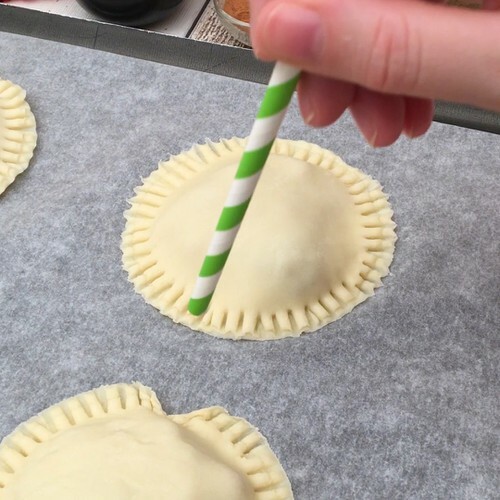 Use a straw to make 2 indents into each circle and add the pastry leaves, then brush the pastry with a beaten egg. Bake in the oven at 180°C for 15-20 minutes until golden brown. Dust with icing sugar and serve warm with custard.